What a month February turned out to be! 5,467 bottles (full sized bottles, single lots of single malt) were sold at auction in the UK, that’s the highest volume of bottles seen on the open market in one month. Monthly volumes have never quite managed to break through the 5,000 bottle barrier… as an indication of how vast last month was, February 2015 saw 2,690 bottles sold. To a large degree, this supply-glut was down to Scotch Whisky Auctions zero seller’s commission offer which gave a boost to the figures. Include memorabilia, blends, bundled lots, grains, mini’s and everything else sold through whisky auctioneers in the UK and, in total, there were 9,587 separate lots to bid on! …Goes to McTears Auctioneers in Glasgow for bringing to market the only bottle ever produced of a 60 year old Dalmore for Drew Sinclair’s 60th birthday. A 1939 60 year old and just one bottle in existence… it doesn’t get much more desirable than that. Interesting to see a top end Dalmore in a little more sedate packaging too. At £7,500 it’s not the most expensive Dalmore ever, and while it’s a rather odd thing to say at this price point, it actually looks like good value for whoever bought it. Scotch is an interesting investment proposition. It’s beautifully simple in its supply/demand driven environment. Supply goes up – Demand stays the same or falls = Values soften. Supply goes down – Demand stays the same or increases = Values harden. Following January’s rather buoyant start to the year, in light of February’s massive increase in supply, we were bracing for an almost unilateral dip in values. With the exception of one major index (Port Ellen) we witnessed some of the single largest ‘in-month’ increases we’ve ever seen. The broadest measure of how Scotch is performing on the open market is the Apex1000 index. December 2015 saw the index step back ‘in-month’ at the year-end by -0.02%; we know a massive supply month can directly impact value growth, and it’s not the first time we’ve seen this. While -0.02% is no crash, it’s still not the right direction for values. Contrary to expectations, the Apex1000 increased by a significant 1.73% in February. It would seem that while supply is increasing it’s being continually outpaced by demand. Looking at a year on year comparison, February 2015 saw the Apex1000 increase by 1.53%… but with fewer than half the number of bottles on the market. Conversely, the Negative1000 index, which tracks the 1,000 worst performing bottles, continued to fall, losing 0.68% in the month to rest at a record low 53.81 (the index started at 100 in 2008). Historically, rather more sedate than other indices, the Rare Malts Selection Index took the reins with a 6.27% increase. Impressive, but we’re not convinced these gains will be cemented. Late 2015’s December-dip saw 2.34% wiped off a full collection of Rare Malts, so we could be seeing a natural correction. Below is an extract from our 2014 full year investment report talking about Macallan’s 25 year old Anniversary Malts and the earlier release 18 year olds. Respectively, these indices moved up by 3.77% and 3.57% throughout the whole of 2014. Current sentiment would appear far more positive for these stunning older bottles as they took to incredible gains last month. Increases throughout February alone out-stripped performances for the whole of 2014. Then there was poor old Port Ellen! A far cry away from the Port Ellen Index’s Feb 2015 all-time high closing position of 456.77 points; twelve months later and we see almost 12% wiped off the value of a collection of Port Ellen OB’s (releases 1 – 8 incl). Values moved north throughout the whole of 2015 by over 23% but, even removing some of the price spikes, like the one in Feb 2015 (full collections being completed maybe?) and the chart suggests we might have reached the top of the current cycle. Could values plateau or even cool a little for the most iconic of silent distilleries? Aside from Port Ellen’s erratic behaviour and a lacklustre performance by the Vintage 50 index, general values advanced impressively amid the challenges of our largest volume month on record and continued turmoil in other markets. An £11,400 loss on the sale of one bottle of whisky. Take into account 10% plus VAT sellers commission and the retail to auction crystallised loss is £13,212, or -49.86%. 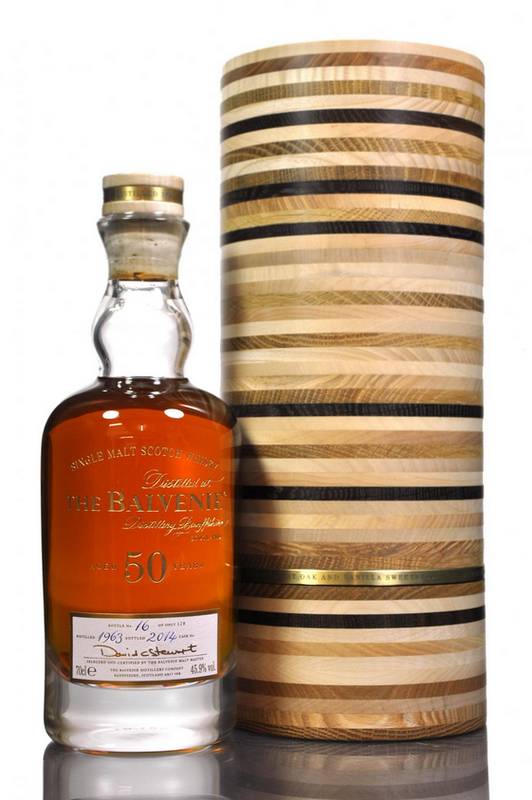 That was the state of play at the recent Whisky-Online Auctions sale for a bottle of the 2014 release Balvenie 50 year old. The retail price for one of 128 bottles from cask number 4570 is £26,500… the hammer fell at just £15,100. How to lose over £10,000 in one trade for one bottle. Why sell such a recently released high end rarity at auction? There’s probably a whole host of reasons from a sellers perspective and one could speculate all day; unwanted gift? Just need the cash? Whatever. Speculation aside, one of the great things about an auction is it shows the true market value for something. I’ve been asked many times if I think the new Balvenie 50’s are a good investment, my answer’s always been no. Certainly not in the short to medium term; long term, possibly; with the lack of old stock at the moment anything’s a definite maybe. A collectors piece? Absolutely… This is without question a halo bottle in any Balvenie collection. If you must have every bottle of Balvenie then you have to get one of these. 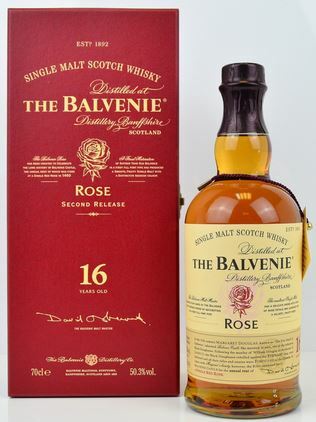 I hope there’s a very happy Balvenie collector out there… or maybe a happy Balvenie drinker?! So the Balvenie sold for 56.98% of its current retail price (hammer price compared to VAT inclusive retail price). In a very different area of the market, lower down the value chain, we saw a bottle sell for 600% more than its current retail price. 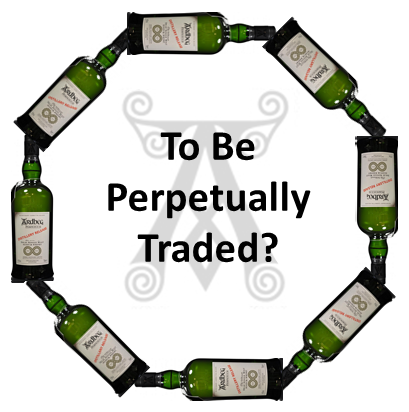 Whisky-Online Auctions brought the first bottles of Ardbeg Perpetuum to market. These first three bottles sold for £490, £410 and £400 per bottle. With a current retail price of £70 (and only available from the distillery), I’ve said it before and I’ll say it again – patience is key when buying if you have future gains at all in mind. Ardbeg’s Marketing team rejected this bottle label as it may have just been a little too obvious. As an example, listed among the first few sales of last years (£120 per bottle) Ardbeg Kildalton, highs of £470, £460 and £450 were observed. Currently, the bottle’s selling for around £125 – £140 at auction. With 12,000 bottles of Perpetuum for sale, rest assured the auction market will be flooded after this years Feis Ile. If you can’t get one on Islay in person, give it six or twelve months, let the dust to settle, and pick one up at a slightly less aggressive price. 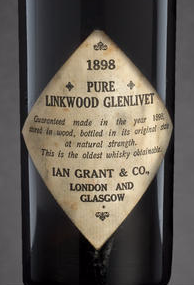 Among the highs and the lows, the usual mix of rarities, collectors bottles and good old drinkers prevailed throughout one of Whisky-Online Auctions usual high quality sales. In what looks to be a run-up to the aforementioned Feis Ile 2015, Islay in general had a great auction. 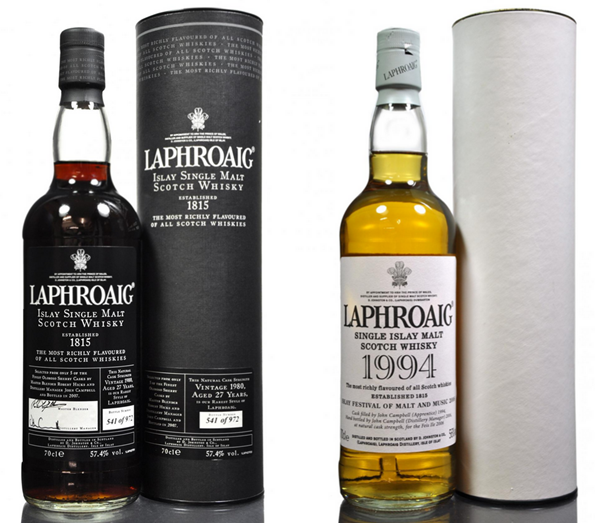 Laphroaig are moving through a real sea-change in prices for their older discontinued bottles. With its 2009 – £400 low-point long in the past, a bottle of 1980 27 year old (Oloroso) managed a huge new record of £1,450. The 2006 Feis Ile bottle settled on a record £400, more than doubling its 2013 low of £165. 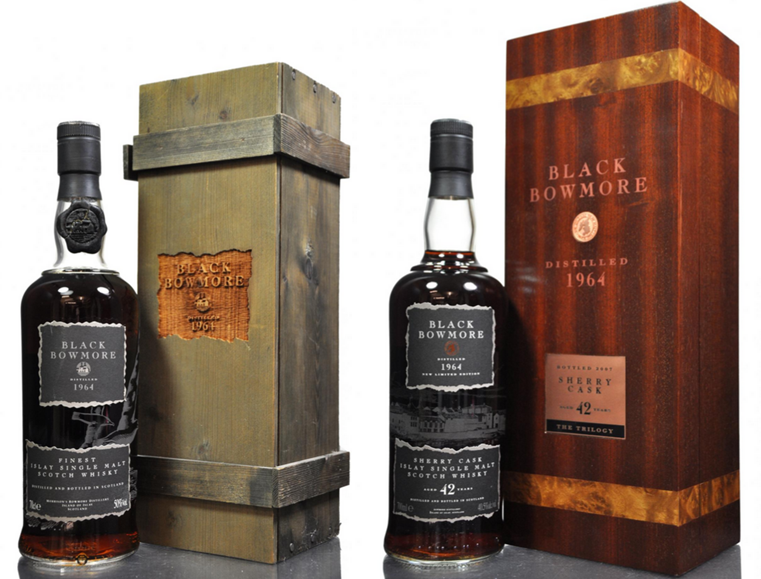 Bowmore saw its 4th release of Black Bowmore fetch £5,900. With a previous auction sale price of £2,700 in 2013 ‘big’ Bowmore’s still pull the crowds. The original Black Bormore first release sold for £4,600, some £400 off its current record but way ahead of its 2010 low of £1,600. Bowmore’s 1972 27 year old also hit a new high when it achieved £700. The most recent price for the 1972 27 year old was £480 and its all-time low was just £120 in 2010. 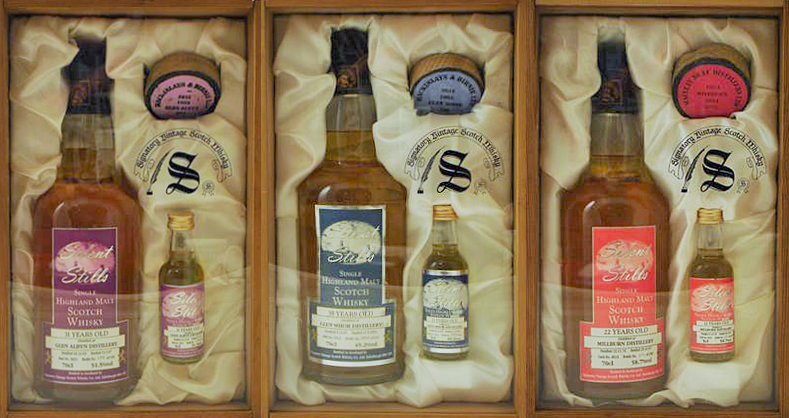 As a collection, many bottles from the Rare Malts Selection have shown signs of values moving north. The standout at this auction was a bottle of 1972 23 year old Clynelish which sold for an amazing £825; more than double its previous auction price of £350. Fellow northern highlander, Glenmorangie, saw a bottle of ‘Traditional’ sell for £135… in 2011 one sold for just £30. Showing how polarised the market is right now, a bottle of Glenmorangie Grand Slam Dram sold for £32.50, its lowest price on record. With so much chaff and distraction in the market from a new release perspective it was pleasing to see continued buoyancy on the secondary market. Full details will be published in our Monthly Market Watch, however, the first quarter of 2015 looks to have been a success for whisky as an alternative investment. 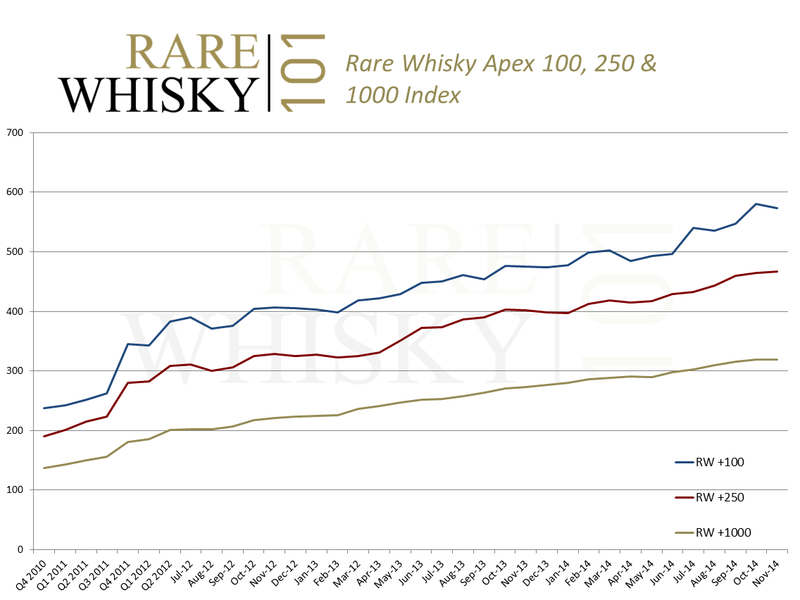 The two core indices for rare whisky, the Rare Whisky Icon100 index and the Rare Whisky Apex1000 index, are both meaningfully up by 7.24% and 4.36% respectively. One shouldn’t count one’s early Easter chickens just yet but the entry into 2015 has been far more positive than the exit from 2014. Vast Supply Stresses the Market. My closing remark from last months update was “I remain cautiously optimistic for November but not quite as bullish as earlier in the year”. That rang very true throughout the month and while I still remain cautiously optimistic, with record breaking volumes, November passed as a month of further polarisation and stability/low growth at best. Early in 2014 our forecast for the number of bottles sold at auction in the UK was 29,500. November saw that figure breached as 3,715 bottles took the total to 29,845 year to date (full sealed bottles of Single Malt Scotch excluding bundled lots). As a year on year comparison, there were 2,023 bottles sold at auction in the UK during November 2013 – November 2014 showed volume growth of 84%. With a further 3,500 bottles expected to be sold in December, the closing year-end figure will look more like 33,500; some 66% above 2013’s 20,211. This remarkable continued growth and vast supply is having an impact on many values. Some of the recent volume-based limited releases are experiencing an accelerated ‘New Release Curve’ where the first few bottles sell for unsustainable amounts followed by an almost cliff-like drop. Ardbeg Kildalton Project peaked at £285 in August and now sits at around £160. While three of the eight composite indices showed growth, none were exceptional. The significant fall in the RWPE Port Ellen Index was primarily due to the first release coming back from a £2,100 October peak and settling back down to £1,300 (equalling Septembers value). Early signs in December show this down-spike should be reversed, at least to some degree. The benchmark RWIcon100 Index remained flat at +0.03%. Twenty six bottles lost value in the month (28 in October), fifty bottles remained the same (43 in October) and twenty four bottles increased (29 in October). A Rose among thorns from a performance perspective. Following Karuizawa’s ‘project Everest’ like growth over the last 6 months it was unsurprising to see some sort of pause for breath. That said, it is encouraging that prices remained broadly in line with previous highs. Both Macallan indices are expected to soften further through December and, for the moment at least, we look to be at the top of values for the 25 year old Anniversary Malts. The 18 year olds have already seen a significant correction (Q1 this year) before rapidly regaining value so it appears Macallan 18’s are set for a bit of a lumpy ride. The Apex Indices (the best performing 1,000, 250 and 100 bottles) remained flat through November with the Apex1000 down -0.19%, the Apex250 up 0.46% and the Apex100 down -1.27%. The Negative Indices, without exception, reached new lows. The Negative 1000 index breached 60 points for the first time, settling at 59.48, some 2.75% lower than October. 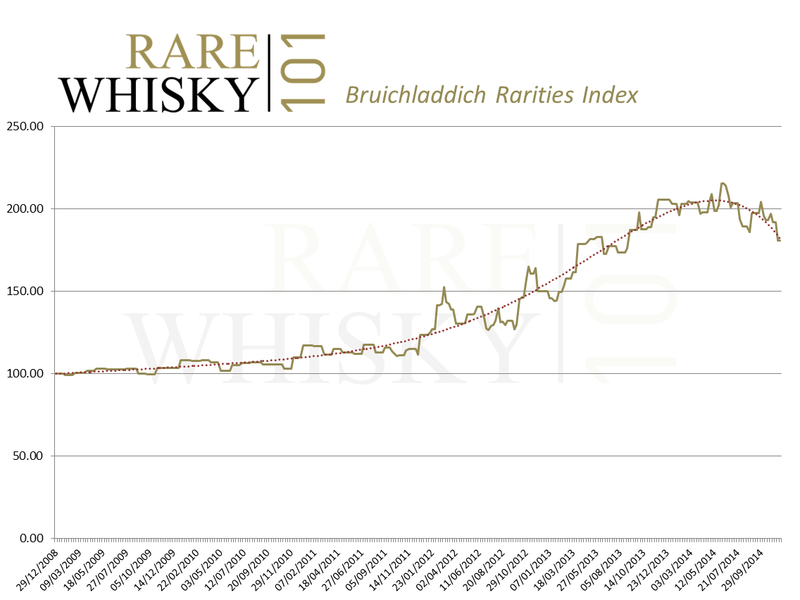 As referenced in last months update, Bruichladdich values stepped back even further, cementing what appears to be a significant re-trace. From a holistic distillery perspective (including all OB’s and IB’s), Bruichladdich values declined by a staggering 13.44%. The following index shows the performance of a collection of sought after OB rarities (including PC5, Octomore 01.1, all Legacy bottles, the 1970 and 1973 vintages plus others). November saw the index open at 196.74 and close at 180.73 – down 8.14%. At its peak in June this year the index reached 215.20 – From peak to trough that represents a loss of 16.02%. There’s clearly a leaning towards oversupply at the moment which is affecting certain high volume brands; however, we are seeing further significant differences in hammer price depending on where a bottle is physically sold. The main low-points (eg the Port Ellen 1st Release selling for £1,300) are being achieved at traditional auction houses rather than on-line. Lower prices and typically higher sellers fees asks the question (again) of the long term viability of traditional auctioneers selling whisky. With less than one month to go until we close the book on 2014 it appears an element of instability has crept into the market. October – Mixed Results with Further Polarisation in the Market. October maintained the significant increase in the number of bottles being sold on the open market. 2013 saw 2,312 bottles sold at auction in the UK (in October). In common with general trends, that number increased by 28.46% to 2,970 in October 2014. That brings the 2014 cumulative total to 26,130. That’s already 29.28% ahead of 2013’s full year figure of 20,211. Values for certain key collectors brands remain strong. Other than the RWM25 (Macallan 25 year old) Index, all core indices experienced gains throughout the month. 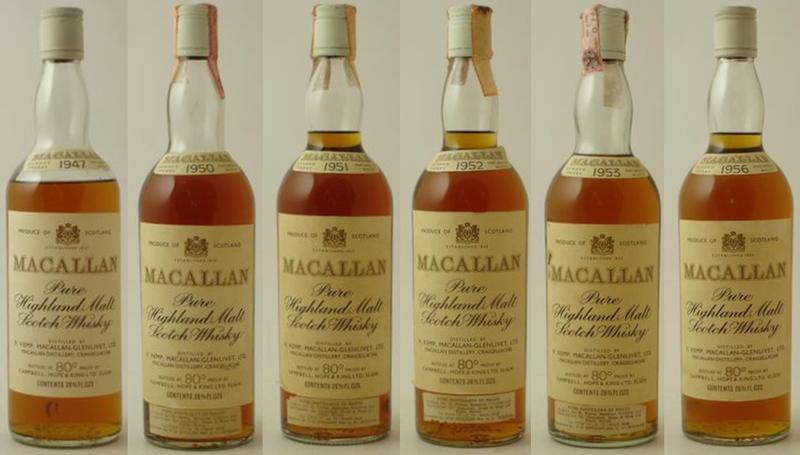 At the end of September the average price for a bottle of (vintage 1957 – 1975) Macallan 25 year old was £1,000.67; that fell to £977.70 at the end of October. On a broader scale, the Apex indices (the top performing 1,000, 250 and 100 bottles) showed positive growth without exception. The Apex 1,000 moved up 1.24%, the Apex 250 moved up 1.01% and the Apex 100 moved up significantly by 6.07%. At the end of September the negative indices (the worst performing 1,000, 250 and 100 bottles) showed signs they had possibly reached the bottom of a steady and persistent descent. For the first time ever, in September, all negative indices turned positive. This positive reversal transpired to be a short lived dead-cat-bounce with record declines recorded at the end of October. The negative 1,000 and 250 indices hit new all-time lows showing stress and polarisation continues in certain areas of the market. The Negative 100 index is just a fraction above its August low of 36.99. Looking at the auction results through October, the clear expectation was for the RWK Karuizawa Index to shine through as a clear leader. While the Karuizawa Index achieved an impressive 5.97% increase throughout October (12 month performance +125.06%) it was the RWPE Port Ellen Index which found favour with collectors and investors. While the RWPE Index’s 12 month figures lag significantly behind Karuizwa at 72.53%, the October results in isolation were quite staggering at +9.45%. The RWPE Index gain was primarily driven by the Port Ellen first release showing significant movement. A £2,100 peak took it way ahead of its £1,300 September close. Other bottles remained relatively stable with the 4th, 5th and 8th releases showing modest increases. The RWIcon100 Index performed in line with the current steady upward trend. Twenty eight bottles lost value in the month, forty three bottles remained the same and twenty nine bottles increased in value. The RWVintage50 Index saw a marginal 0.46% increase, due entirely to the Dalmore 1926 50 year old which moved up in value by 66.67%. The worst performer was the 1957 Macallan Anniversary Malt which lost 28.21% of its value. Following Septembers significant gain (12.65%), the RWB Brora Index had a far more stable month. The 2003 and 2004 releases showed good growth but this was largely mitigated by a decline in value for the 2006 and 2008 bottles. 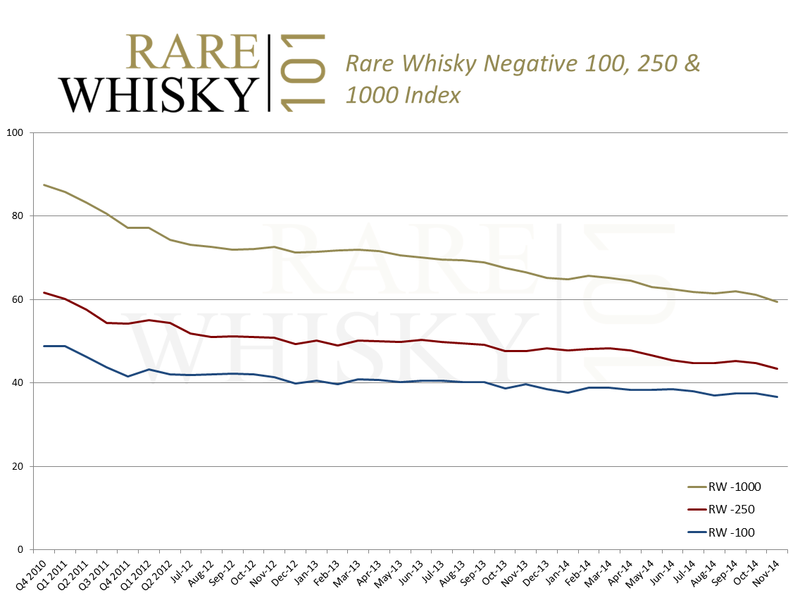 The RWRMS Rare Malts Index remained broadly static at 0.40% up on Septembers close. The most significant increase was a doubling in value for the Aultmore 1974 21 year old. The worst performer was the Teaninich 1972 27 year old which lost 44.00% of its value over the course of the month. The most noticeable element of polarisation belonged to Bruichladdich who saw values take a 2.72% broad-based decline. Until the vast amount of supply on the open market decreases, expect to see further falls. With values for certain distilleries continuing to drop, in some cases rapidly, there still remains uncertainty throughout parts of the market. While the Apex 1000 index moved up 1.24% in October it’s on the back of a 2.00% rise in September. November brings with it an increase in supply like we’ve never experienced before. With that huge supply may come an element of cooling in the broader market. I remain cautiously optimistic for November but not quite as bullish as earlier in the year.